Happy Weekend everyone! We’re back with a new Fashion meets Interiors feature to inspire you today with an outfit styled by Julie Pratz of Studio Seven Style! Julie Pratz is a self-described fashion psychologist and personal stylist who is committed to transforming wardrobes and enhancing confidence from the inside out. Her company, Studio Seven Style, helps give her clients the tools to make fashion fun instead of frustrating. She has spent the last ten years building relationships and is most passionate about the work she is doing to empower people to look and feel their best. As a previous fitness trainer turned image consultant, Julie has a developed a unique perspective when it comes to fashion and style. Influenced by art, architecture and nature, she aspires to help people reflect who they are designed to be while standing out in the crowd. 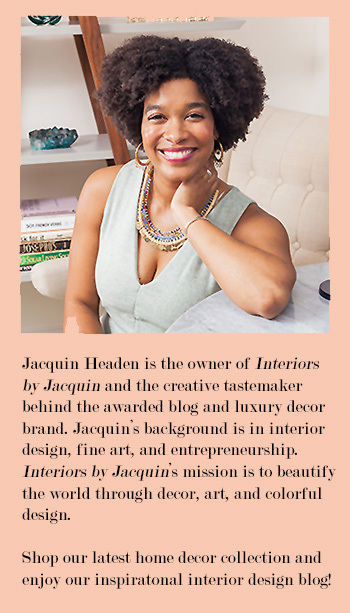 Today Julie has styled model Valencia Roy in an outfit to match this stunning space and her personal style. 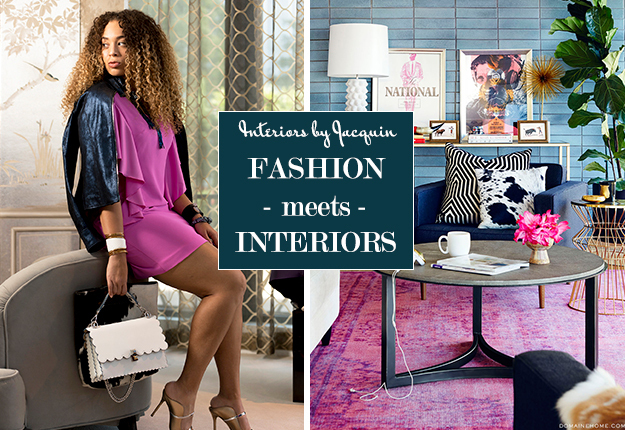 Read on as Julie describes her inspiration for completing this Fashion meets Interiors look. I would define my personal style is California chic: warm, modern and alluring with a splash of rock and roll. The pink dress was inspired by the beautiful rug. I love that both items are elegant but still have a warm and comfortable feeling. The navy chair inspired the blue metallic jacket because both have a bit of sheen and are structured in form but luxurious in appearance. My favorite part of any outfit is the accessories. This is where you can transform your outfit and take it from drab to fabulous! Accessories for an outfit are like the art on the wall in an interior space, they should be both very personal and unique. I selected the long gold modern Vita Fede earrings to mirror the long lean legs of the table and the gold frames on the art. I chose an eclectic mix of bracelets to reflect the modern and eclectic feel of the room. The Matthew Campbell (MCL) blue topaz bracelet has similar color and shapes as the blue rectangles on the back wall. The leather and stone bracelet was inspired from the pictures of the bull and matador as well as the horns on the table. The white and gold alligator cuff had a strong contemporary feel which I connected with the white couch and gold side table. 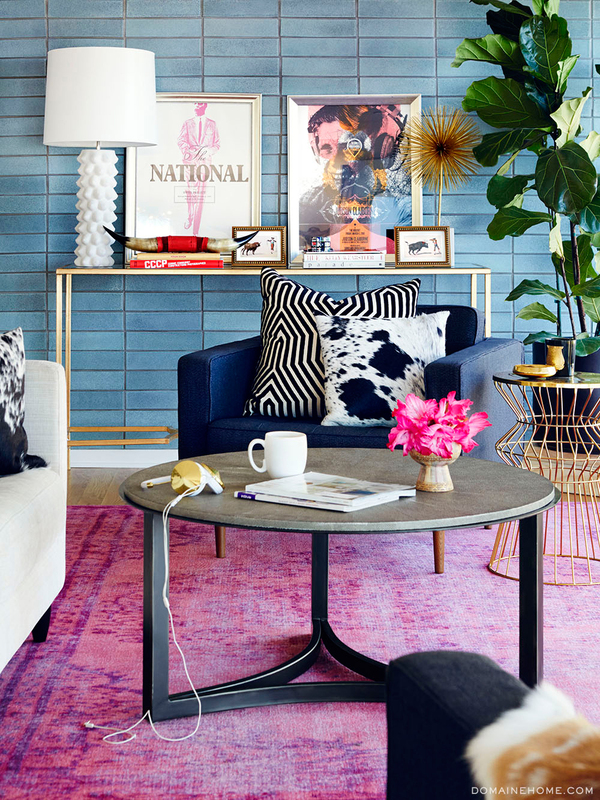 The MCL necklace tied the darker metallic blue with the lighter blue and created a connection and focal point as the chair does for the wall. The cowhide tote mirrored the pillow on the chair and I paired it with the bright white handbag to give my models outfit a more layered look. The chic white Fendi handbag reminded me of the lamp with the scalloped edges and modern retro look. Last but not least- the shoes. The bronze shoes by Malone were inspired by the bronze table with dark linear legs. The table and the shoes connect in color and line and design: both have structure and curves which translate as modern yet feminine. Overall this interiors space and the outfit reflect my personal style: warm, modern, alluring, fun, elegant with a touch of edge.